Bas Jan Ader, Thoughts unsaid, then forgotten, 1973, mixed media, dimensions variable. A seamless integration between life and art, as well as liberal doses of death and myth, permeate any discussion of the Dutch-born artist Bas Jan Ader, who lived and worked in Los Angeles until his mysterious death in 1975. That Ader was lost at sea en route across the Atlantic in a twelve-and-a-half-foot boat, the smallest yet to attempt the journey, during the second phase of his three-part project In Search of the Miraculous, only adds to the mystique. But even beyond the facts surrounding his oceanic demise, there is a feeling of something unknown and assuredly treacherous that echoes throughout Ader’s small but powerful body of work. The photographs and installation in this exhibition highlight his attraction to the ever-present inevitability of loss—whether in the benign passage of one moment into the next or in the fraught drama of a body tumbling through space. 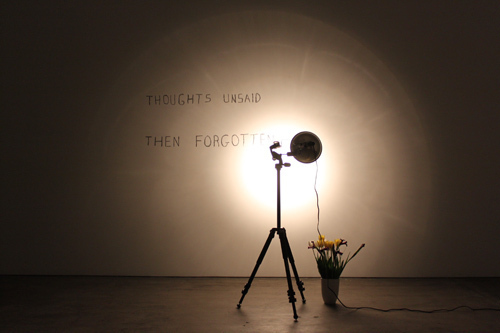 The installation, Thoughts unsaid, then forgotten, 1973, present here in a 2011 reconstruction, is composed of the title text, handwritten on a wall and illuminated by a single lamp on the floor, and a vase of flowers that bloom and then wilt for one week (the duration of the original installation) before being replaced. With its lyricism and ephemerality, it recalls the work of another Conceptual artist who met an untimely end, Felix Gonzalez-Torres—specifically his expansive piles of hard candy. But for Ader, poetry was more often embodied in action. In one of his celebrated spills documented on film, Broken Fall (Organic), 1971, he dangled precipitously from a tree before releasing the limb and plunging into a river below. The ghostly black-and-white photograph of the event, Broken Fall (Organic), 1971/1994, crystallizes a state of slippage; here Ader is frozen, midair, in a kind of ecstatic suspension.